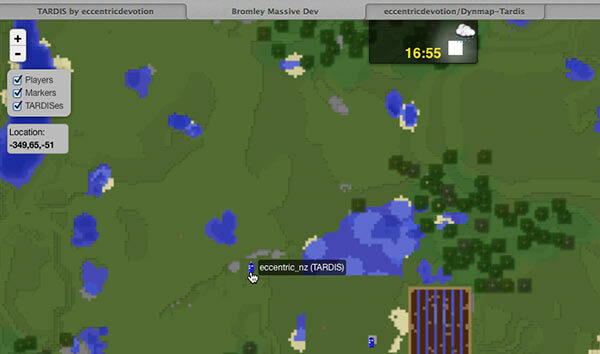 If you have Dynmap installed on your Bukkit server, you can use the Dynmap-TARDIS add-on to display the real-time locations of all TARDISes. Install Dynmap as per the instructions found on the Dynmap page. Run the server once to generate the default Dynmap files and folders. Drop the Dynmap-TARDIS.jar file in the server plugins folder. Put the tardis.png icon file ( ) into the plugins/dynmap/web/tiles/_markers_/ folder. Stop and start the server.